I'm back! .....and I'm sharing another fun Coffee-Themed Christmas card. Like I've already mentioned, I created all my cards ahead of the Winter Coffee Blog Hop and got them all photographed and ready to roll for the hop because I've been travelling during the event. But that doesn't mean that I haven't been checking out all the fabulous cards and projects that have been shared. 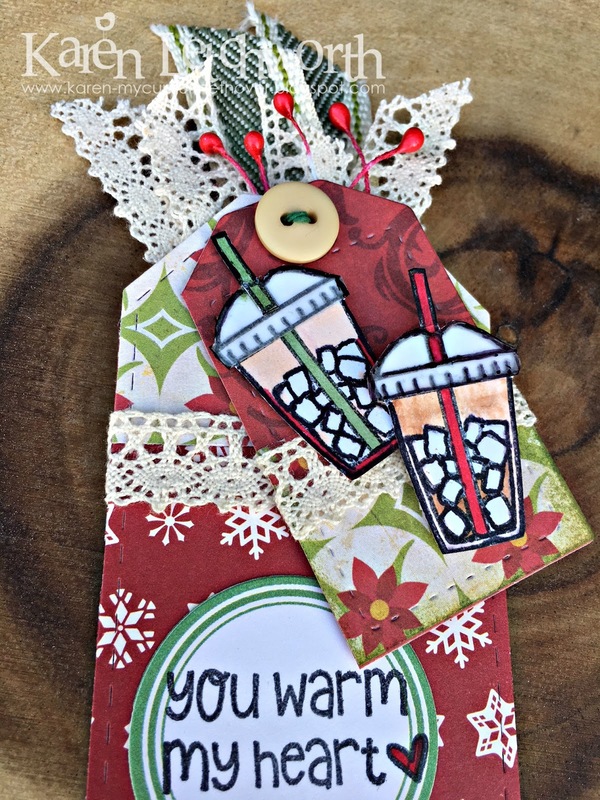 I made this sweet little double tag (a small tag on a larger tag) using more of the same Echo Park Season's Greetings patterned papers that I've been using throughout the hop. The larger tag is from Paper Sweeties For You Sweet Cuts, and the smaller tag is from Paper Sweeties Stitched Tags #1. I added lots of fabulous lace and ribbons, and I tucked in just a few Red Double-Head Stamens. The cute little iced coffees that I stamped, cut, and colored before placing them on to my smaller tag are from a cute stamp set called Coffee Break from V's Sweet Ideas. The (You Warm My Heart) sentiment is from Paper Sweeties, and it is stamped on an October Afternoon journalling sticker. Pretty simple, but super cut and lots of fun. Thanks for stopping by to take a peek! 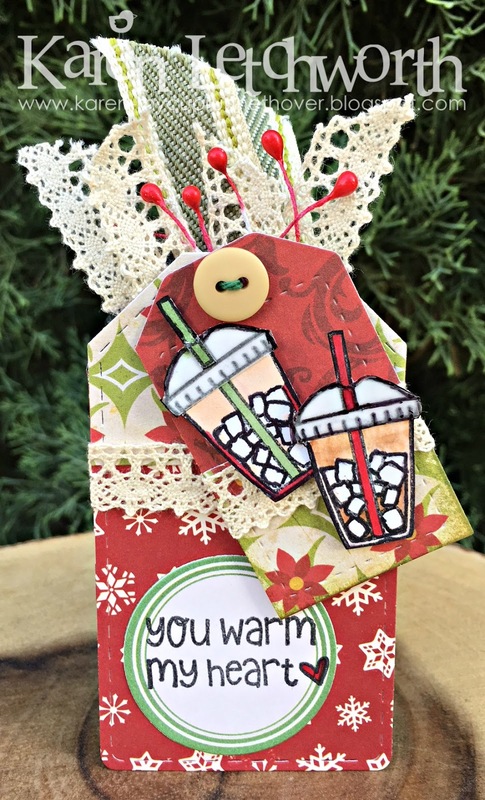 Winter Coffee-Loving Cardmakers' Blog Hop - Anything Coffee, Tea or Cocoa Related With a Winter Theme. My cute iced coffees are from a cute stamp set called Coffee Break from V's Sweet Ideas. Simon Says Stamp Wednesday Challenge Blog - Simon Says "Stitch It" - I used TWO stitched tags (two different sizes) for this project. What a sweetie - I had my first iced coffee for a long time this week and it was perfect - strong and tasting like coffee and loaded with cream and ice cream - bliss! I better not have too many of them!! This is just darling, Karen!!! Such a fun idea with the double tags! cute tag on a tag. love the colors and ribbons. beautiful tag. Cute little tag to go with the big tag. Great project. That coffee is making me COLD --- lovely tag - do not like ice coffee however - brrrrr - give it to me strong and hot - like a rich Mocha - regular or Peppermint Please ~ thank you very much - always enjoy your crafting Karen - lovely additions always! So cute, love the tiny tag on big tag! Love the double tags. I like how you colored the straws red and green. So cute! Love those cups with the ice cubes! Beautiful tag! Love the embellishments! Super cute! 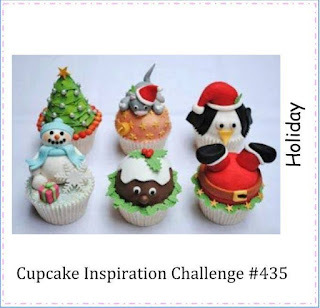 So glad you shared with us at Cupcake Inspirations!